While I have had a lot of close calls, I recently came upon what I can honestly call “the best barbecue” I’ve had in my entire life. And I owe that honor to a summer-long residency by Adam Perry Lang, who currently lives (that’s what the Airstream is for), cooks and feeds serious barbecue seekers on the Jimmy Kimmel Live! backlot in Hollywood. From now until September 5th, he’ll be serving up his pecan wood-smoked specialties every Tuesday, Wednesday and Thursday for lunch. 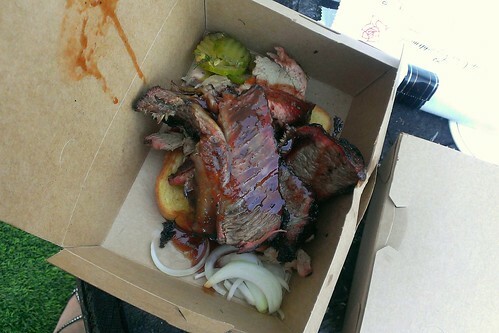 Everything in this awesome ‘cue is made from scratch (okay, perhaps not the meats), from the charcoal in the Texas burn pit to his 2-ton, custom pit smoker – and even the cutlery, which he literally carves himself.